Audio CD Labeler is a smart music CD label creator that creates CD labels covers and jewel case inserts ! an easy to use music CD label creator and CD music label maker for you ! 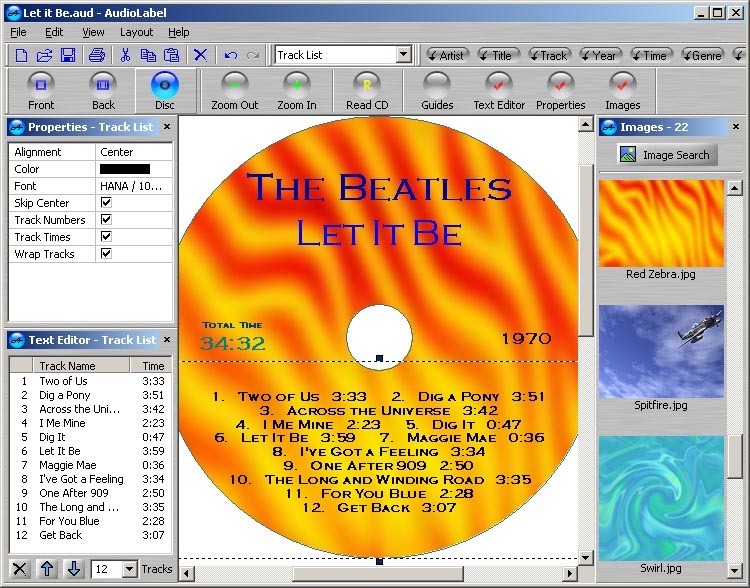 CD Label Creator - Audio CD Labeler is smart cd label creator that helps you create and print a cd cover or jewel case insert. Our cd label creator has been specifically designed for the audio enthusiast. After making a cd, most people don't bother printing a label because they think it takes too much time. We've changed that way of thinking. CD Label Creator - Audio CD Labeler can automatically find your album information (artist, title, and track list) and fill out the label for you. Easily add images, backgrounds, or photos using the integrated thumbnail viewer. You'll be able to make professional CD covers in just a few minutes. There's no need for typing when CD Labeler can recognize your CD and download the album information from the Freedb internet database. This database is enormous, and most likely contains every album in your CD collection. For mixed CDs, the album information can be found by searching the CD Player .ini file, or by reading CD-TEXT directly from your CD. And for MP3 enthusiasts, our cd label maker can even read and label your MP3 CD using the ID3 tag and filename. Easily add images using the smart thumbnail viewer. CD Labeler viewer supports many image formats and incorporates a simple "drag and drop" interface. You can quickly explore images in any folder or use the search function to scan your computer for thousands of images. And of course, our CD labeler CD label creator includes a cool art gallery that will get you started right away. Arranging your label text is hassle free with "AutoFit" technology. This feature helps optimize the font size and arrange your text so it always fits in the space you specify. Your text is never allowed to go off the CD label, so you'll get a perfect fit every time. This feature is especially helpful when adding a large track list to the CD label or cover. Unlike other CD labeler or CD label creator, you'll never be locked into a particular brand of paper. CD Labeler - CD label creator includes label templates for all popular brands including Avery, Belkin, CD Stomper, Data Becker, HP, LabelGear, Mertiline, Memorex, Neato, PressIt, Surething, and TDK. Even non-standard labels can be adjusted using the "Label Alignment Wizard". No matter what kind of paper, our cd label software can print your CD label or cover with ease. CATraxx - CATraxx is a powerful database program designed to help you maintain an inventory of your music collection. IntroCreator - IntroCreator The quick and easy way to create an intro for your CD. CD DVD Label Maker - Acoustica CD DVD Label Maker is one of the best CD label creator and DVD label maker, Make your own CD labels, DVD labels and jewel cases with the ultimate in ease and flexibility ! CD Label creator and DVD label maker all in one !